Silk is a browser created by Amazon, specifically for its portable devices. 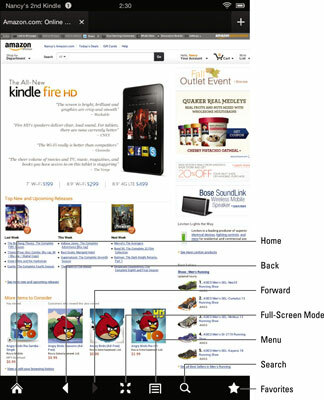 Some people wondered why Amazon didn’t choose to use an existing browser, such as Internet Explorer, for Kindle Fire HD. The answer is that Silk takes advantage of Amazon’s ability to use its own servers to make your browsing experience fast. 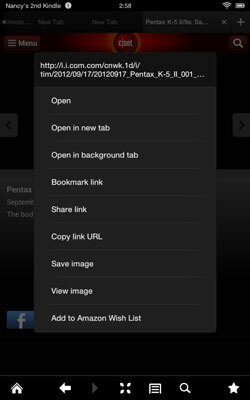 From the Kindle Fire HD’s Home screen, you can tap the Web button to display the Silk browser. You can display an Address field at any time by swiping down from just below the tab bar (don’t swipe from the Status bar at the very top or you’ll display the Notification screen). Items in the Options bar help you to navigate among web pages. You can use the Back and Forward buttons on the Options bar to move among pages you’ve previously viewed. To search for a page, tap the Search button, enter a site address using the onscreen keyboard, and then tap Enter. Results of the search are displayed. Silk uses tabs that allow you to display more than one web page at a time and move among those pages. Tap the Add button in the top-right corner — which features a plus sign (+) — to add a tab in the browser. When you do, thumbnails of recently visited sites appear. You can tap on a thumbnail to go to that site, or you can tap in the Search/Address bar that appears when you add a tab and enter a URL by using the onscreen keyboard and then tap Go on the keyboard. Swipe down just under the tabs bar to reveal the Address field and then tap the Bookmark button to the left of that field (it looks like a little ribbon with a check mark in it). With a site displayed onscreen, tap the Add button and then tap Bookmarks. Tap the Add Bookmark button in the lower-left corner of the screen. Whichever method you use, at this point the Add Bookmark dialog box appears; tap OK to bookmark the currently displayed page. You can then tap the Add button and tap Bookmarks to display thumbnails of all bookmarked pages. To delete a bookmark, after tapping the Bookmarks tab to display thumbnails of bookmarked pages, press and hold a page. In the menu that appears, tap Delete. In the confirming dialog box that appears, tap OK and the bookmark is removed. Web pages can contain a lot of content, so it’s not always easy to find the article or discussion you want to view on a particular topic. Most browsers provide a feature to search for content on a web page, and Silk is no exception. Tap Menu on the Options bar. In the list of options that appears, tap Find in Page. The onscreen keyboard appears with the Search field active. The first instance of a match for the search term on the page appears in an orange highlight. Subsequent instances of the word on that page are highlighted in yellow. Tap any of these highlighted words to view the related content. Tap Done to end the search. Most folks spend a lot of time online browsing to find what they want. Search engines help narrow down what they’re looking for by using specific search terms; they then troll the web to find matches for those terms from a variety of sources. 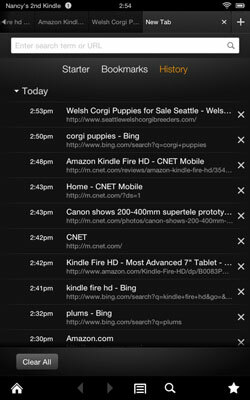 Tap the Add button to add a tab in the browser if you want search results to appear on a new tab. Thumbnails of recently visited sites appear. Tap in the Search/Address field. 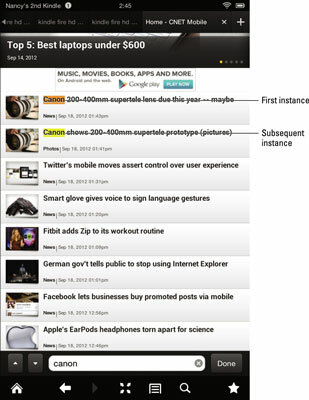 The thumbnails change to a list of bookmarked sites, and the onscreen keyboard appears. Enter a search term in the Search/Address field and tap Go. Tap a result to go to that page. 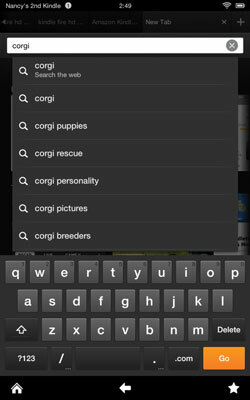 To specify a search engine to use other than the default, tap the Menu button in the Options bar, and then tap Settings. 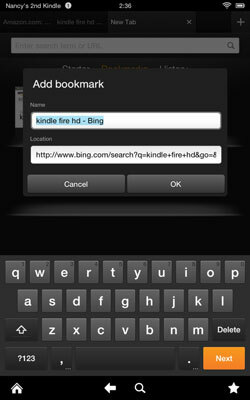 Tap Search Engine option to choose Bing, Google, or Yahoo! as the default search engine. The ability to review your browsing history comes in handy. With Silk open, tap the Add button. Tap History, and sites you’ve visited on the Kindle Fire HD appear in a list divided into categories such as Today and Last 7 Days. Look over these sites and, when you find the one you want, tap it to go there. There are a few things you can do to work with contents of websites using Kindle Fire HD. For example, you may find online content, such as a PDF file, that you want to download to your Docs library or an image you want to download to the photo gallery. You can also open or share content you find online. View downloads: Tap the Menu button on the Options bar and then tap the Downloads button to view completed downloads. Save or view images: Press and hold an image, and a menu appears offering options such as Save Image or View Image. Open, save, or share links: Press and hold your finger on any linked text until a menu appears offering options including Open, Open in New Tab, Open in Background Tab, Bookmark Link, Share Link, and Copy Link URL.